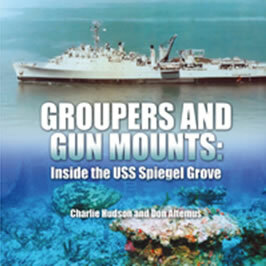 After one notable correction brought about thanks to some of the men who had served aboard the USS Spiegel Grove, the short photo-heavy book of Groupers and Gun Mounts: Inside the USS Spiegel Grove is fully published and available through the usual on-line sources of Amazon, Barnes and Noble, and BooksaMillion. It can also be ordered through Outskirts Press, your favorite bookstore or contact me for direct sales. It is not a good candidate for e-book, however, due to the number of photographs. Again, our thanks to all who helped provide subject matter expertise for the book. It was a fun project. 53-page soft-cover book; 15 photos. I’ve enjoyed the Upper Keys wrecks and have a lot of hours exploring and teaching on the Spiegel Grove. Charlie Hudson’s Groupers and Gun Mounts is a great book for those of us who have been on the ship many times and I think is especially useful for anyone who is planning their first dive on the SG. I have known Don Altemus for many years and have been diving with him in the Dominican Republic. I am proud of my influence on Don’s spirit of exploration and for assisting in my work on Spanish treasure galleons of the 17th and 18th centuries. Even though the wreck of the Spiegel Grove is from a more modern era, Groupers and Gun Mounts will give divers an inside look at the personnel and activities occurring daily on each deck level while the ship was in service. Wreck divers coming to Florida need to know about the Spiegel Grove in Key Largo, Florida. My front door opens into the Atlantic Ocean. As an expert on diving wrecks in South Florida, I’ve often been involved in ships’ deployments to create artificial reefs. The diving community is fortunate that Charlie Hudson has co-authored Groupers and Gun Mounts. Her book, Islands in the Sand, is the dictionary on the “business of artificial reef creation.” Don Altemus has been photographing South Florida wrecks from my boat for 30 years. Don and Charlie are uniquely qualified to introduce divers of all skill levels to the story of the Spiegel Grove. CHARLIE HUDSON, an Army veteran and avid scuba diver, joins again with Don Altemus to bring a special book for those who served on the USS Spiegel Grove, and those who dive her today. Charlie has authored Islands in the Sand: An Introduction to Artificial Reefs in the USA, as well as scuba-related novels. DON ALTEMUS, a Florida native and longtime banker, has more than thirty years experience diving and photographing wrecks. His 100-plus dives on the Spiegel Grove have resulted in a thorough appreciation of the ship and most of the photographs seen in Groupers and Gun Mounts. Retail Price $21.95; Spiegel Grove Veterans’ Special $20.00 (all prices include shipping). Our apologies, but we cannot take credit cards at this time. Please make checks payable to Charlie Hudson. Five bells during Middle Watch – the dark sea on a clear night with glittering stars and a bare slice of moon. The throb and rhythm of a ship when most of the 300-plus personnel are asleep and the night crew of sailors and Marines man designated twenty-four hour stations. This was the quiet of 2:30 a.m. on the USS Spiegel Grove as she plied the waters of the Atlantic, the Caribbean, the North Sea, the Indian Ocean, the Persian Gulf, or the Mediterranean. The quiet of the Spiegel is different now, submerged in the silence of South Florida waters fifteen fathoms and more down as she sits at a bottom depth of 134 feet; the crown jewel of the artificial reefs of Key Largo in the Upper Keys. The USS Spiegel Grove, at 510 feet in length and eighty-four feet in width, is of the Landing Ship, Dock (LSD) class of ship. These ships, conceived of during World War II for amphibious assaults, were designed to carry and launch assault boats, other equipment, and personnel. Part of the design was a well deck, a cavernous open area in the aft third of the ship that could be flooded to a depth of four-to-six feet. The flooding allowed landing craft and other equipment to motor in and out of the vessel when the stern gate was lowered. Anyone who has watched movies like “The Longest Day” or history shows of the June 6, 1945 D-Day invasion of Normandy has seen the value of LSDs as armed troops in landing craft and other military equipment emerged from ships headed for the beaches. Although the USS Spiegel Grove was commissioned on June 8, 1956, after both World War II and the Korean War came to a close, the Landing Ship Dock 32 Class (LSD-32), named after the Ohio estate of President Rutherford B. Hayes, served the country for thirty-five years during the Cold War. The Spiegel Grove, sometimes referred to as the Spiegel Eagle, the “Grove”, or by other nicknames, participated in war games around the globe, ever ready in the days when the Cuban Missile Crisis, the Suez Canal Crises, and other hostilities marked tensions between the superpowers. Kevin, a native of Maine, worked in the Combat Information Center in radar and navigation from June 1980 to August 1983. After he left the service, he began to faithfully chronicle the history of the LSD-32 and in 1996 he established a marvelously detailed web site at www.kevinflatley.com. Photographs, bits of history, and personal memories are updated on the site where friendships can be renewed or sometimes started as connections are made. The life of a ship, as with most things, is limited and unless there is a deep historical significance, a decommissioned vessel is likely to become a part of the “mothball fleet” that is under control of the Maritime Administration (MARAD) at the James River in Newport News, Virginia. It is there where more than 200 vessels have come to rest; their final disposition to be ultimately determined. The Spiegel Grove was not an exception; she was officially decommissioned in October 1989 and entered into the James River fleet, her guns silenced, cranes idle, and her stores empty. The men who had once stood on her decks watching sunrises and sunsets now saw her partially stripped, paint flaking, rust taking hold. Those who might turn their thoughts to her as she had been had no way of knowing that on a rather ordinary night in 1994, or perhaps it was 1995, a casual conversation at a bar in Key Largo, Florida, would bring the USS Spiegel Grove to life again. The USS Spiegel Grove, electrical wiring dangling, radar systems removed, might be past her glory days, yet the size of her, the well deck, the multiple levels, the long corridors, the cranes—what incredible diversity for divers. The Spiegel was a vessel that you could dive time after time and still find something new, and it was substantial enough that it wasn’t likely to break up during storms. And with that assessment, the USS Spiegel Grove no longer faced the potential of becoming scrap metal; she was set onto the path instead to become a habitat for millions of marine creatures, a playground for divers and anglers, and an economic workhorse for Key Largo. Not the life she was originally designed for, but a life that would endure beyond her three and a half decades of naval service.